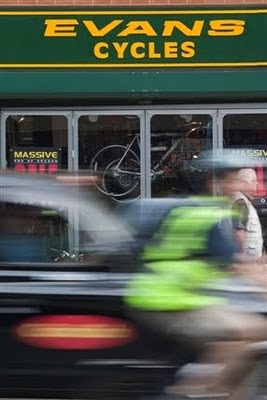 Picking up my bike from Evans Cycles ('the UK's largest specialist cycle retailer') last night it had supposedly been through a full check-up before I arrived. So why was the front stem not on straight and the tyres only inflated to 30psi, when they should have been at least 60psi? Did it include checking spoke tension, I asked (as they are machine-built wheels)? 'We look to see if the wheel is wonky' was the reply. Having said that, the price was fantastic (and they knocked an extra £150 off the sale price without a quibble) and the advice on buying a new light was good too (the salesman even told me not to replace my existing rear light). I would have to say that the quality of advice given by other staff was pretty poor (one even claimed not to know anything about lights!). They also offer an excellent price match service which means that even if you find the item cheaper in the seven days after you've bought it they will refund the difference. So good value, but don't expect to get the same service as a proper local shop (although they can also be very grumpy and stuck in their ways). Can I just say that a decent machine built wheel shouldnt need spoke tension checking until it has been ridden for a while as the spokes will bed in over a period which would be covered on your 1st service. Hi and welcome to my cycling blog. I'm a married 40-something living in the English West Midlands, with my wife Clare and young son, Oscar. I've been cycling for pleasure, fitness and practicality for years. I used to cycle to work in London and I ride longer distances whenever possible, including a few tours - Land's End to John O'Groats, and in France, Germany and the Czech Republic (see details above). As H G Wells said: 'When I see an adult on a bicycle, I do not despair for the future of the human race'.